Figure 1. Variation (°C) from the long-term (1970-2015) average (orange line) in annual average maximum temperatures in the Russell and Mulgrave local landscape (data from Innisfail). The shape of the blue line shows the natural, observed variation in average temperatures between years – we all know that some years are hotter than others. By comparing the blue line to the orange line, we can see how this variation relates to the long-term average of temperature; above the orange line, average annual maximum temperatures are hotter than the long term average, whereas below the orange line they are cooler than average. Figure 2. Variation (mm) from the long-term (1970-2015) average (yellow line) in annual rainfall totals in the Russell and Mulgrave region (data from Babinda post office). Figure 3. 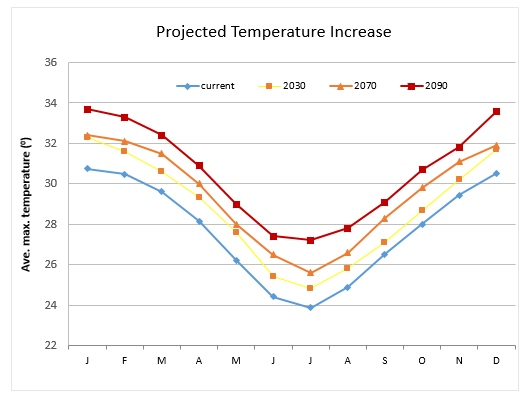 Projected increase in average maximum temperatures from the observed historical average temperatures from Innisfail (1970-2015, blue line) to 2030 (yellow line, based on climate model Had GEM2-ES), 2070 (orange line, model GISS-E2-R-CC), and 2090 (red line, model IPSL-CM5B-L2). Figure 4. Number of days over 35°C under ‘Business as usual’ emissions scenario (MIROC5 climate model) http://www.climatechangeinaustralia.gov.au/en/climate-projections/explore-data/threshold-calculator/. Figure 5. Increased height needed to maintain the current level of exposure of assets to flooding from high tides & storm surges, under ‘Business as usual’ emissions scenario https://www.climatechangeinaustralia.gov.au/en/climate-projections/coastal-marine/marine-explorer/#. Less predictable weather: Knowledge based on past experience is becoming less reliable as temperatures and sea levels rise and extreme weather events become more common. It will become increasingly difficult to rely on our past experience to make decisions about where to build houses and infrastructure, which crops to grow, which pests and diseases to target, and how to manage fire. Climate change and industries: Some of our region’s most important economic industries, such as sugar cane and grazing, will not be immune to the effects of climate change. By planning ahead and maintaining a willingness to try different approaches, we put ourselves in the best position to improve the resilience of our region’s important industries. Climate change and communities: Rising sea levels and temperatures will affect our communities and lifestyles, but working together and making decisions based on reliable information will ensure our communities continue to thrive. Climate change and natural systems: Increased disturbances as a result of climate change will impact on our local landscape’s natural systems, plants and animals. While the exact consequences are difficult to predict, we know that a large, well-managed system of protected areas will improve the resilience of our natural systems. There will be opportunities for everyone to get involved in shaping a resilient and sustainable future for the Russell Mulgrave Local Landscape.For more information on climate change, including links to more detailed climate change modelling for our region, go to the Climate Futures page. 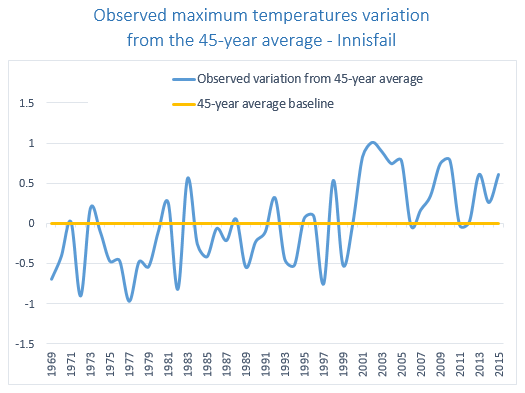 Long term temperature records from Innisfail (there are no official, continuous long-term temperature records from within the local landscape) show that average temperatures have generally been on an increasing trend over the past 30 years. During this time, average annual temperatures in the Russell and Mulgrave landscape have been above the long-term average much more often than they have been below it (Figure 1). 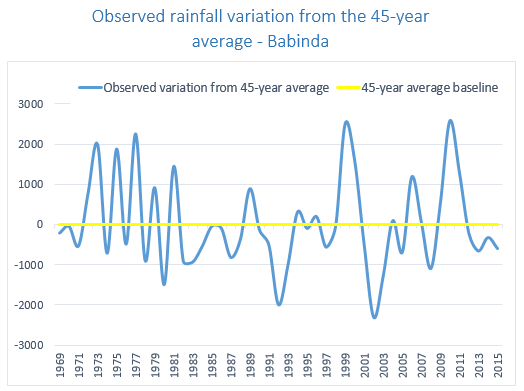 Long-term rainfall data from the Babinda post office show that rainfall continues to vary dramatically between years, and that there is no obvious increasing or decreasing trend in annual rainfall at this stage (Figure 2). As time goes on, higher temperatures will be reached more frequently. For example, maximum daily temperatures during January are projected to increase from the current average of 30.8°C to 32.3°C by 2030, 32.4°C by 2070 and 33.7°C by 2090 (Figure 3). Furthermore, there will be a longer season of high temperatures, with average daily maximum temperature exceeding 30°C from October to April by 2090. While we are likely to see an increasing trend in temperatures as a result of climate change, one of the most concerning predictions coming from climate scientists is the impact of greater variability and less predictability in our weather patterns, making it harder to plan. There is a lack of long-term temperature records in the Russell and Mulgrave catchments region, with the closest official temperature measurements from Innisfail. Sharing reliable information collected by residents of the region would help people keep track of how the local climate is changing. This could also be a way of recording and sharing observations about the survival, growth, reproduction, health and so on of native and pest plants and animals. Having access to this local information will make it easier to discuss changes and try possible management responses. The sucrose content of sugarcane can decline if temperatures are high and/or there is high rainfall during the ripening and harvest season. Areas of cultivation in low-lying coastal areas will be vulnerable to sea level rise, either through sea water inundation, increased tidal reach or salt-water contamination of coastal aquifers. Heavy rainfall events associated with cyclones or other systems can prevent planting or harvest, with serious economic implications for cropping and horticulture industries. Climate change may bring new diseases and pests, which we know potentially pose enormous threats to our agricultural industries. Flooding associated with extreme rainfall will affect waterways and floodplains, potentially increasing erosion in these areas. The region’s sugar and other industries may also be impacted by increasing bottlenecks in processing or distribution networks. For example, heat waves, cyclones and floods all have the potential to result in shut down of industrial operations such as the Mulgrave and South Johnstone sugar mills, either through workplace health and safety concerns, power failure, flooding or damage. Operation of regional facilities such as the Cairns and Mourilyan sea ports will also be affected by storm surge, cyclones, flooding during heavy rainfall, and extreme heat. Considering the importance of ports to both the import of fuel, food and other supplies, as well as to the export of regional produce, more frequent closures are likely to have significant economic implications for the region. Climate change will also impact the commercial fishing industry. For example, intense cyclones can cause several months of lost operations due to large amounts of debris or sediment in the water and damage to boats, marinas, ramps and other infrastructure. Commercial fishing operations will be affected as certain types of fish move south due to increasing water temperatures, as coral bleaching becomes more widespread and as conditions decline in fish breeding and nursery areas. Changing climatic conditions will challenge our established ways of doing things, but may also present new agricultural and commercial opportunities. For example, it may be necessary to diversify or switch crops or breeds to suit new climatic conditions, or to change practices. In order to adapt to new and changing climatic conditions, we may need to shift farming and other commercial enterprises to different parts of the landscape. This could create opportunities for the restoration of wildlife habitat on former agricultural land, but could also create conflict between the need to protect existing habitat and also maintain production. Doing things the way they’ve been done for generations won’t necessarily keep working as climate conditions continue to change, meaning that traditions and local wisdom will be challenged. Everyone will be affected in one way or another by climate change: some types of farms may not remain viable, certain areas along the coastline may become unsafe to live, and some of our iconic species may not survive in the new conditions. While change can be unsettling, new opportunities may come out of new ways of doing things, especially by working together across sectors and industries. Importantly, being informed about the types of changes we can reasonably expect means that we can develop plans and strategies to adapt to these, rather than being taken by surprise by unusual climate events. Although people in the Russell Mulgrave area are used to living with high temperatures, we can expect that periods of extreme heat will become more common and even hotter. For example, the number of days hotter than 35°C in Innisfail is projected to increase from the current average of two to nine by the year 2050 under the ‘business as usual’ emissions scenario (Figure 4). More people will be vulnerable to heat-related illnesses and stress, especially sick, elderly and very young people, and people living without air-conditioning. In the same way that maximum temperatures are increasing (Figure 3), minimum temperatures are also rising. This means that overnight temperatures will remain above 20°C for more months of the year, potentially affecting sleep quality, especially for households without air conditioning, and increasing the use of air conditioning in households with it. Sea levels are already rising and models project that sea levels in this region will increase by an average of 0.14 m by the year 2030, and by an average of 0.65 m by 2090 under a business as usual emissions scenario. By 2030, homes and other assets along coastlines in the Russell and Mulgrave landscape would need to be 0.14 m higher (and by 0.79 m in 2090) to maintain their current level of exposure to flooding from the ocean (Figure 5). Low elevation areas of the coastline will be most vulnerable. Rising sea levels will increase the tidal extent of coastal rivers and streams, meaning that tidal reach is likely to push further upstream in the region’s short streams, affecting homes, businesses and crops on adjacent floodplains, as well as roads and other infrastructure. Even a modest increase in sea level height will mean that there are many more high tides and storm surges, increasing coastal erosion, flooding and contaminating freshwater systems with salt water. The CoastAdapt tool (https://coastadapt.com.au/) helps people making decisions in coastal areas to understand and asses the risks posed by climate change in their regions. The impacts of sea level rise will be compounded by more frequent and intense heavy rainfall events in the region, as well as more intense (though probably less frequent) tropical cyclones. There will be an increased threat to the extensive low-lying areas along the coastline in the Russel and Mulgrave region from river flooding and storm surge as well as cyclonic winds. People living in buildings that can’t withstand severe cyclones will be very vulnerable during cyclonic winds. In addition to flood risk, there is an increased potential for soil erosion and land slippage, especially on the steep slopes of the ranges in the west of the region. Local planning for development, stormwater drains, roads and bridges will be affected. We can expect more frequent interruptions to grid-based electricity supply as well as to fuel and other supplies due to shut down of the region’s rail lines, sea and air ports during extreme weather events. Working together to identify how to address back-up power and supply issues will help build the Russell and Mulgrave region’s resilience in the face of these changes. Evaporation is projected to increase on average by around 4% annually in north Queensland. Evaporation increases in some months are expected to be even higher (e.g. 7% increase in January, projections from climate model Had GEM2-ES). Areas likely to be most impacted are those where the potential for intense bushfires is already high, for example in the Goldsborough Valley, around Walsh’s pyramid, and localised areas around Fishery Falls, Deeral and Babinda. Areas that are not currently considered to be at risk of severe bushfire may become more vulnerable as fire weather increases and vegetation changes. Various programs are available to assist with developing and implementing adaptation strategies (for example, the QCoast2100 program for local governments to develop Coastal Hazard Adaptation Strategies http://www.qcoast2100.com.au/). Natural systems have coped with changing climatic conditions in the past but current changes are happening so fast that some species may not be able to adapt. Because climatic factors such as temperature and rainfall play such an important role in determining the suitability of different areas for plants and animals, we can expect that changes in temperature and rainfall will change the suitability of the landscape for certain species and systems. The result of climate change will be new combinations of plants and animals, sometimes in new locations, challenging our concept of what is ‘natural’. Even fairly small changes, such as the increased recruitment of colonising (or pioneer) rainforest plant species can have a substantial effect on the suitability of an area for other plants and for some animals. It’s also likely that this region will become more attractive to people moving from other areas that become less liveable. Increasing pressure for housing and more infrastructure to support growing populations will potentially lead a push for more clearing of native vegetation. The Russell and Mulgrave landscape is likely to retain climate conditions that suit many of the species that are currently found here.However, some animals and plants may no longer be able to survive or reproduce in the area. For example, habitat for cassowaries will be impacted by sea level rise, with the loss of coastal freshwater wetlands, and by changes in the fruiting patterns of plants resulting from warmer temperatures and changed rainfall. Modelling shows (http://climas.hpc.jcu.edu.au/maps/) that lowland areas will rapidly become less suitable for cassowaries over the next decade. Under a business as usual scenario of greenhouse gas emissions, suitable climatic conditions will continue to decline and by the year 2065, the lowlands south of Deeral to the Russel River will mostly be unsuitable for cassowaries. By the year 2085, suitable climate is projected to have disappeared from most lowland areas, with suitable climate contracting to elevated foothills and ranges. In reality, changes may not unfold exactly as these models project, but these projections have complex implications for how we manage landscapes to protect our plants and animals; we have to protect areas that are currently important so that threatened species survive, but also consider where important habitat will likely be in the future, together with whether and how plants and animals would be able to move there and establish. These considerations affect our decisions about which areas to protect and restore, as well as how to manage factors such as fire in these areas. Coastal species in particular are at risk from sea level rise, for example as beaches are inundated and freshwater wetlands and coastal scrub transition to salt-tolerant vegetation communities. There will be fewer nesting beaches for sea turtles, and a range of birds and mammals will be affected by the loss of freshwater wetlands as beaches and dune systems are inundated or eroded. Iconic wetland systems such as Eubenangee swamp, together with the abundant wildlife they support, will be under threat from more intense flooding and salt water contamination. We can also expect widespread dieback of sea grasses and mangroves in lower intertidal zones, due to sea level rise, more intense cyclones and storm surges. These impacts will have a range of flow-on consequences for fish, dugong and other estuarine and marine life. Strategies such as the planned retreat of human settlements and infrastructure from coastal areas may reduce the risk to humans and also create opportunities for natural systems to shift landward. In addition to the direct effects of increased temperatures and changed rainfall, climate change will have a range of indirect effects on other factors that drive natural systems. A major impact of climate change for natural systems will be more frequent and/or more intense disturbances, such as floods, heatwaves and cyclones. For example,increased intensity and frequency of river flooding, together with increased water temperatures, will change aquatic systems, as well as those fringing waterways or on floodplains. Narrow riparian vegetation will be particularly vulnerable. More extreme rainfall events will also increase the frequency of intense disturbance to in-stream invertebrates, animals and plants, and exacerbate the issue of soil and pollutant runoff entering the region’s wetlands and the Great Barrier Reef lagoon. On a national scale, the Russell and Mulgrave Rivers are among a small number of watercourses identified as being priorities for conservation of freshwater biodiversity under climate change. Prospects are bleak for the Great Barrier Reef under a business as usual scenario of climate change. Bleaching of coral reefs will continue to be more widespread as average temperatures increase and heatwaves become hotter and more common. As hot spells occur more frequently, reefs won’t have time to recover from previous bleaching episodes and will eventually collapse. Reef systems will also be affected by more acidic sea water (caused by higher CO2), more intense cyclones and freshwater pulses associated with heavy rainfall events. Managers of biodiversity are already working to minimise or reverse impacts of land clearing, pollution and introduced plants, animals and diseases on natural systems. Climate change is an additional impact that interacts with these existing pressures. The resilience of natural systems to cyclones and other disturbances is improved by having a large and well-managed network of protected areas. It’s not possible to predict the exact consequences of climate change for plants, animals and their habitats, but sharing observations, trying new management practices and monitoring their outcomes will help build the new knowledge required to promote adaptation of natural systems to climate change.